Numerous news sources were reporting the removal of the books, while images and videos circulating on Twitter purported to show the protests against Darwish’s ouevre as well as the packing-up of Darwish’s books. 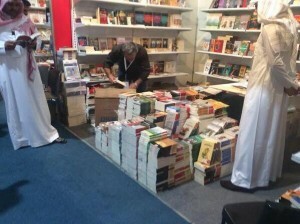 The order was reportedly given Wednesday to remove Darwish’s books from the fair after protestors objected to alleged blasphemy found in his works. A large crowd gathered, and security reportedly had to be called in. After that, the PVPV ordered the books removed.